Well, here I am. The motherland of my heritage, Italy. The first thing I need to do is figure out how I’m getting to Spain next. Originally I was going to go from Munich to Paris to Interlaken then to Barcelona. However for whoever is familiar with Europe, that is a trip that makes no sense. To go from Munich to Paris is about 12 hours by bus, then from Paris to Barcelona is another seven hours by train. Why make that exaggerated zig zag when I can just continue south to Milan then west to Barcelona? Sounds simple enough, right? I should know better, nothing is as easy as it sounds. I caught a break a few times throughout my trip considering everywhere I went, people spoke English (except Belgium but I was only there for a day). Although most people speak English in Munich, Miranda was there to guide me along so I never really had to deal with the locals too much. Milan is a different story. I was struggling to find anyone who could understand my questions let alone answer them. All I want is to find out where I could buy train tickets to Spain. Just an international train and not the regional one. After countless finger pointing and games of charades, I made my way to the ticket booth. An hour or so passes by as I try to keep myself sane. There is little to no WiFi here, my phone is dying and I have no idea where my hostel is. Finally, I hear my ticket number being called and I’m able to speak to someone. I let the the teller know that that I’d like to go to Barcelona in two days. The look I received foreshadowed the rest of my day. It was this slightly confused and inquisitive look like when you tell a child “no” for the first time. Here is where it gets interesting. Turns out since I waited last minute to book my next trip I am pretty much screwed for a few reasons. First, I didn’t realize that Barcelona was 600 miles away from me. Second, the way the train system works in Europe there are some trains you need reservations to be on and some you do not. Considering I had the train pass and the route I was taking wasn’t the most common I assumed, stupidly, that should be no problems. Well, I was wrong. I could book the first half of the ride with no issue, but after that there was a problem. There was no guarantee that a train would be headed towards Spain when I got there. Third, there was absolutely no way for Trenitalia (Italy’s international train) check because I would be in Nice (France) which is not their company. Meaning I had to risk being stranded in a train station for the night or find another way. I tell the lady, thanks for everything but I’ll have to think about this. Fantastic. I head back into the busy terminal to figure out what I am going to do. I check Blablacar to see if there is a ride heading in that direction but of course there isn’t, it’s about a 10 hour drive. Who in their right mind would take this route but a lost tourist? The last option is I could try and find the bus terminal and see what they have to offer. Again playing a game of charades I find the right counter. I explain my situation and receive another confused yet inquisitive look. The teller calls over a coworker and they do the best they can to help me. It seems as if there is one bus that for whatever reason is heading directly from Milan to Barcelona before heading to Madrid and onward. My eyes widen and a look of both excitement and relief explodes from my face. I completely caught the teller off guard because he hasn’t told me the bad news yet. This was going to cost me $130. Can this day get any worse? I thank the the tellers for everything but I am going to need some time to figure this all out. My first two hours in Italy have been spent sitting down waiting for my number to be called. Normally I would be up for a “let’s see where this takes me” adventure and take the train but I had to be in Pamplona in a week for the running of the bulls. What’s more important $130 or risk missing running of the bulls. I head back to the second teller and purchase the bus ticket. Thankfully, I remember that students or people traveling under the age of 26 get a backpackers discount and I was able to drop the price down to $112. Even after the discount I was frustrated at the hit to my funds but decide it’s time to get the hell out of this station and find my hostel. Either I am just getting used to the motions of traveling or the trip from the station to my hostel wasn’t too bad. Even wandering around aimlessly didn’t bother me. The only thing that was getting to me was the heat. It was a pretty drastic change from Munich’s cool 75 degrees. I have no idea what the temperature was now but it was enough to have my shirt soaked by the time I reached the hostel. I can not wait to take my shoes off and put this damn backpack down. I check in, get my keys, a few basic directions, and a simple hand pointing in the direction of my room. I turn the corner and realize that this hostel is not the prettiest thing I’ve come across. It genuinely looks like they converted a ghetto high school into a hostel. I mean it who am I to complain I get what I pay for and it certainly explains all of the graffiti I came across on the way here. I look for my locker, which ends up being in the middle of the hallway and make my way into my room. I flip the light switch and nothing happens. I flip it again hoping it was just a fluke and still nothing. Bravo Milan bravo. I situate myself in the first bunk I could find and head out to explore the rest of the hostel. After going up and down a few stairways I finally find the bathroom. I take my money belt off and place it on top of the toilet paper dispenser. Within a millisecond of sitting down, a bunch of people decide the bathroom is the best place to be loud and rowdy. I can’t even use the bathroom in peace today. I rush back to my room to plan the rest of my day. I am organizing my things when I start to smell citrus. Confused I look around to see my bunkmate relaxing in his bed. I ask him about the light and he laughs. He tells me how tried complaining to the receptionist four days ago but quickly realized that it wasn’t going to to get fixed and he was right. I introduce myself and preparing for the usual travelers tango. “Where are you from? How long are you staying for? Where are you headed to next? How long have you been traveling?” Almost instantly the conversation took a different turn. Kyle was traveling from England by bicycle in hopes to reach Asia. How batshit crazy can you be to ride over 2,000 miles on a bike? He made it this far I have admire that, but it seemed as if he did not stay very long in any of these places. 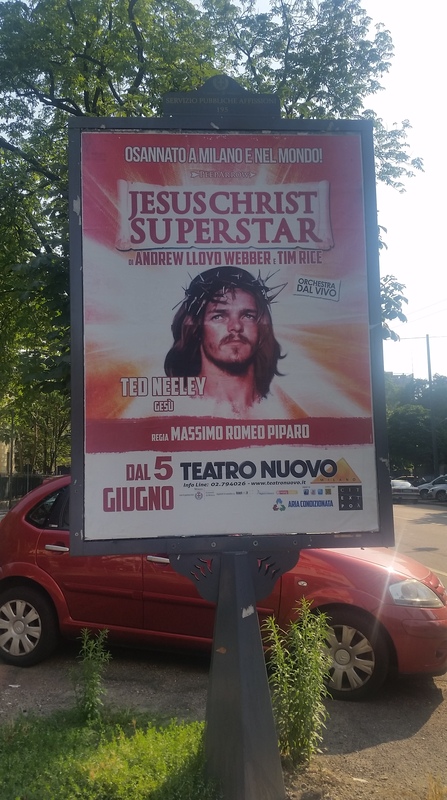 I ask him “why have you stayed here for the last four days than?” I swear Milan is full of surprises. He chuckles. “I decide to do a barcrawl that the hotel I was staying in recommended. I go out have me a few drinks and find myself a lovely girl. Everything seems to be going my way! Hell, I even took the girl back to my room and had a great time. But wait here is the kicker it wasn’t until the next morning things turned sour pretty fast” Kyle continues to peel his orange in silence. Silence again as he devours half of the orange. His $1,200 bike was stolen right outside of this hotel and in a matter of a night his dream trip is ruined, stopped dead in its tracks. I mean in comparison I am having a great day compared to his week. But I can’t help but find it comical that the only reason he is still in this god forsaken luck of a city nights is because he can’t leave. I can’t help but thank lady luck for my experience so far. The conversation between us continues until he heads off to find some food. I look at my map and try to figure out what my plans will be today. As I go to reach for my map I realize that I don’t have my money belt. My heart starts to race. Everything I own of value is in that. My passport, every credit card, money, my train pass, my life. The more I things I realize that are in there the faster my heart races. I open the door, ba bum, turn down the hallway, ba bum ba bum, rush to the bathroom, ba bum ba bum ba bum, open the door and see that my money belt is not there anymore. Ba bum ba bum ba bum ba bum. I fly down the hallway to the front desk, not even having time to think of what could happen next. I manage to mutter out some words with emphasis on money and belt. He stares at me blankly. I stare back, ba bum ba bum. It felt like an eternity that he was just staring at me, but in reality, it couldn’t have been more than a few seconds. He reaches under the counter and hands me my money belt. There it is, my entire trip in a stranger’s hands. I head back to my room and finally decide to open it. My passport is there, I pull out each one of my cards and everything is there. I open the zipper and see that my cash is gone but I could care less. Hell, the person can consider that his finder’s fee, what’s $60 to me compared to everything else. I go to take out my train pass and realize that it’s just the cover left. My heart begins to race, except this time it’s fueled by anger and not fear. I raise my fist to punch the wall and realize that this isn’t the time or place for that. I take a deep breath and tell myself to calm down. I search the money belt one last time and find it hidden behind other papers. I spent the next 10 minutes searching through everything over and over again in disbelief that I was this stupid. I could have been stranded and broke less than 2 weeks into my trip. I can’t help but be overwhelmed with what kind of downward spiral today is turning into. I need to go out and break this cycle before anything else happened. I’m only in Milan for a few days and I want to make the best of it. I use the hostel Wifi to see what is recommended for me to do for the two days I am here. It’s hard to tell if it’s just my mood or the reality of it but nothing really catches my attention. It’s strange how I am half way across the world having the time of my life but I still feel after an unfortunate chain of events, bummy. I grab what I need while locking up everything I don’t and head out the door. I usually try my best not to use maps, as silly as that sounds, because but I am forcing myself to get a better sense of direction. Not only that, staring at a map or phone the entire time I am traveling to my destination really defeats the purpose of me even being here. I am here to experience the sights, the smells, the sounds of these cities as I venture not just take a few cool photos and pretentiously experience the culture. I want to be cultured not just another face passing through. As I wander back in the direction that I believe the train is in I come across a park. I decide to walk through it for no other reason than just because. Even though it’s over 100 degrees out that isn’t stopping the locals from being out. I round a corner and hear a few yells and grunts coming from a caged area. Confused, I head toward the sounds just in time to see a teenager playing soccer pull a flawless crossover on a full grown man with enough speed and precision to send him to his knees. It was quite a sight to see. Although what I saw was impressive it was the cheers and noise that echoed I admired most. Here are kids playing with adults in 100 degree weather enjoying themselves. This show was distracting enough that I forgot I was melting. I felt a bead of sweat drip down my forehead and that was my notice to find the metro station. I stare at the metro map focusing on the stops that lead me straight to the center of Milan. The interesting thing about Europe, contrary to the US, is that most major cities are outlined in rings. I mean this is completely understandable considering the history most of these cities especially Italy has. 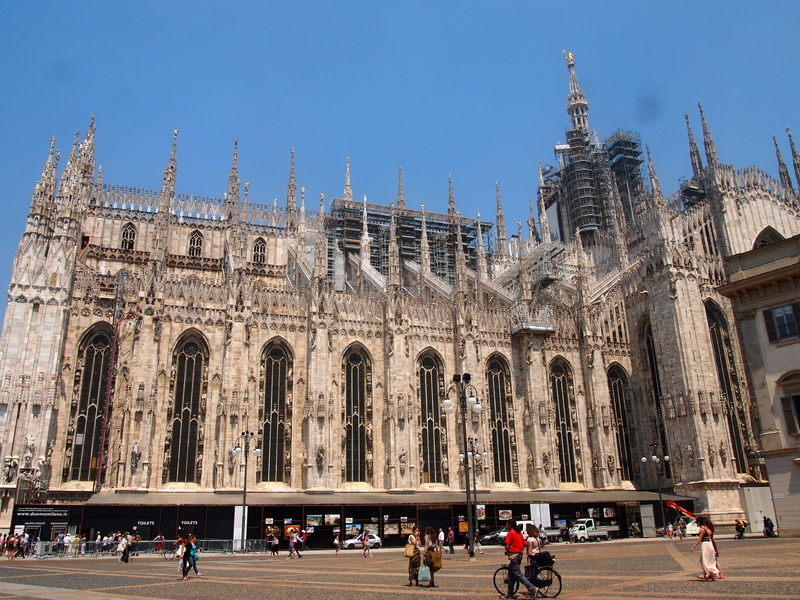 Milan, for example, was considered to be the capital five times throughout its history. The first time in the 14th century, second in the 17th century and three more times in the 18th century, each expanding itself with the growth of the nation mimicking the layers of a tree. This makes it really easy to find the most interesting and eldest attractions. I knew this time would come at some point in my trip, I just didn’t expect it to be on a subway in Milan. I started to feel it when I was in Munich but it was faint, I completely lost it in Switzerland because of how active I was but here I am on a random metro car feeling it. The feeling itself is hard to explain because it’s a kaleidoscope of emotions. The best way to describe it is the feeling of familiarity. Which seems strange to me because I’ve never been on this train or in this city nor this side of the globe before but this train feels familiar. It’s not enough that I would consider this home, of course, but I don’t feel on edge. I feel comfortable. I mean hell I’ve reached the point in my travels where the first thing that comes to mind after sitting down was how comfortable these rock hard obnoxiously red plastic metro seats are. I truly thought to myself “This is hands down the most comfortable seat. I should write this down for my journal later.” Who in their right mind puts down how comfortable a metro seat was? If that isn’t enough to shows the level of comfort I have traveling than I don’t think anything will. You really don’t get the chance to judge something as mundane as this until the experience of taking random metros becomes mundane itself. This is similar to learning how to drive when at first everything was so vivid and tense. The feeling of the wheel shaking beneath your grip ever so slightly, trying to feel out what level of pressure means life or death on the pedal, taking your father pleads to focus on the road making simultaneously making you realize that you almost forgot you were driving. The mentality behind that follows with everything new. It’s how we naturally understand the world around us. Being able to multi-task indulging in fast food while driving and singing to the radio yet somehow still having the brain power to realize that there is a new store on a route you’ve taken every day. This is the feeling I have on the metro. 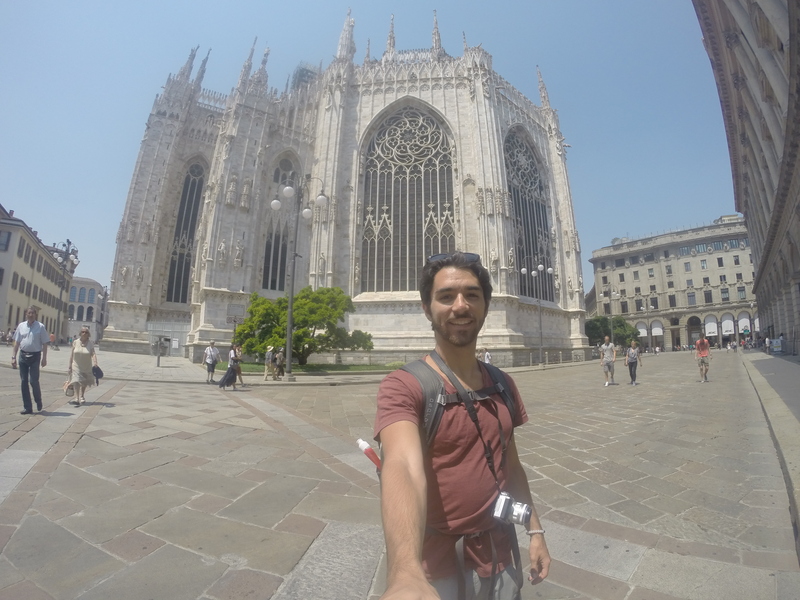 Eventually, I reach the stop “Duomo” following the crowd who always know the best way out. It’s even hotter than I realized, and it’s just an hour or so past noon. As I reach into my pocket to pull out my phone I can already feel the humidity through my jeans. Why the hell did I think wearing jeans today would be a good idea? My phone is at 15% and it’s a million degrees. I can’t tell if it’s because of the weather or is my battery finally giving out. I stare at google maps trying to figure out where I am and what is around me. 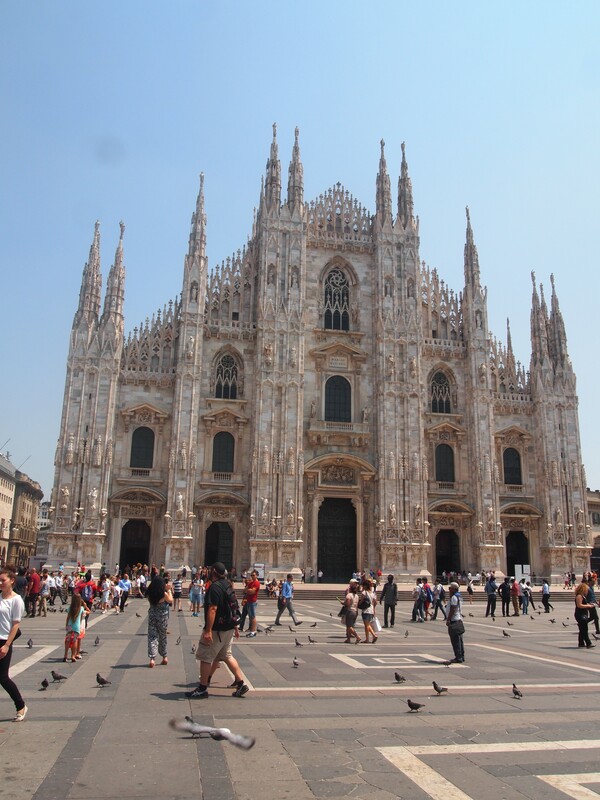 I notice that one of the most recommended sites was Duomo Di Milano which is the famous church in Milan. A perfect example of how everything important tends to be in the middle of a city. I spent about 15 minutes wandering around attempting to find the correct street I notice the museum for MichelAngelo. As I walk through the courtyard I realize that this isn’t going to be free like the most of the museums in London and New York but I decide to check it out anyway. I have always found MichelAngelo to be a very interesting character in history between his inventions and his artwork. Unfortunately, the cost to get in was more than a meal here and that itself was the deal breaker for me. After walking through the courtyard trying to admire as much as I could for the price of free, I exited through the far side. As I emerged through the arch I felt a sense of openness and quickly realize right in front of me was what I had been searching for. Duomo Di Milano. To be quite honest, I have not seen many churches prior to this trip. Sure I’ve been to and driven past many before, but never any that made me think “wow”. Yet somehow Europe has found the way to capture something in its architecture that I have not seen before. It’s as if you can sense its importance just by looking at it. The exterior of this church alone shatters the imagination. You can almost sense the blood, sweat and tears that have been poured into its gothic design. Something about the dark churches have always allured me. I spent the next half hour just exploring and attempting some photography. As I explored the area, a strange thought came to mind. Everywhere around me I couldn’t help but see people with selfie sticks and cameras. Every attraction I’ve seems to have the same characteristics surrounding it. Massive amounts of people, taking photos of things we know have importance but not what that importance is. I couldn’t shake this thought out of my head. What could of this place of looked like during its construction? At it’s unveiling in 1805? 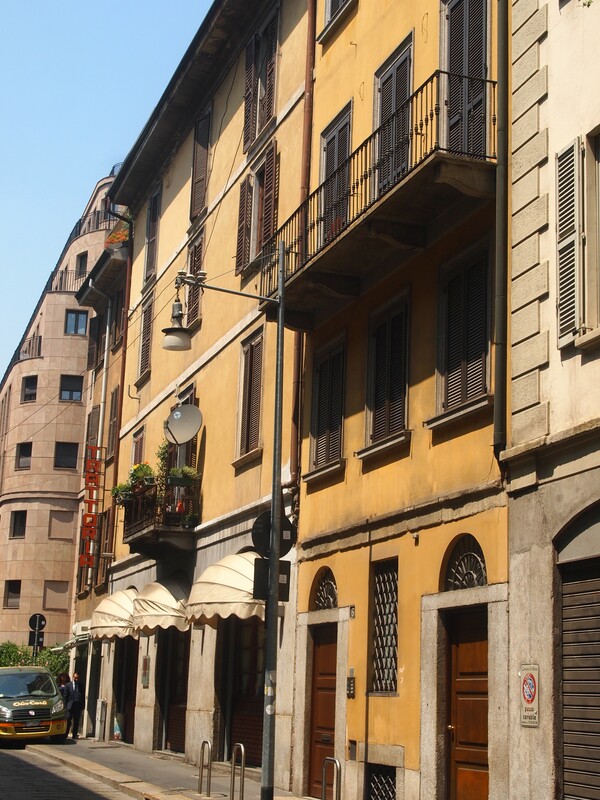 What was the talk of the town when it’s design was proposed in 1386? Did everyone realize how important this structure would be to its culture? It was like a dam finally broke releasing an overflow of unanswerable questions. All of these questions eventually leveled out and two remained. What have we created that will last beyond our culture? And more importantly, what have I created?